Although the giant eland (Taurotragus derbianus) is acknowledged as the largest antelope on earth, their average size overlaps with that of the common eland (Taurotragus oryx) to such an extent that the title is generally shared between the two. 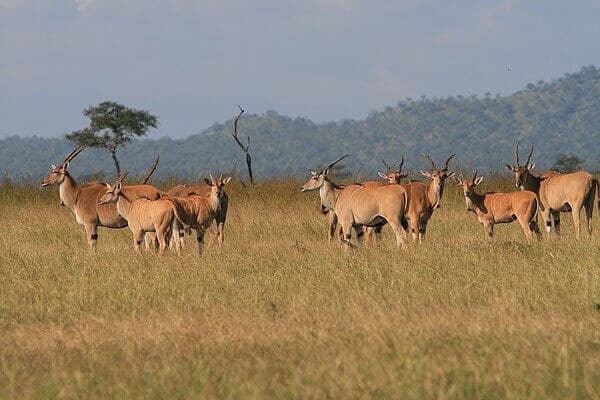 The male common eland grows to around 1.6 at the shoulders and can weigh almost a ton, while the females are considerably smaller, tipping the scales at only 500kg, with a shoulder height of 1.4m. Despite their large size, these animals are surprisingly nimble, able to jump 3m high from a standstill, and gallop at 40km per hour. While this makes them the slowest antelope, they make up for this by being able to maintain a spanking trot of 22km per hour indefinitely. Eland are among the most easy-going creatures on earth. They have no strict herd structure or territorial jealousies; they can survive for up to a month without water, and are not fussy feeders. Generally, these transient herds consist of either males or females which join up during the breeding season. While eland are predominantly browsers, subsisting on succulent leaves from flowering plants, they will readily eat less desirable forbs, trees, shrubs, seeds and tubers when pressed. They are also known to yield to the temptations of lush summer grasses, and turn to grazing. Eland usually eat only in the morning and early evening, resting up during the heat of day. Throughout history eland have been used as a source of meat, leather, and milk – an eland cow may produce about 7kg of rich nutritious high-fat milk daily which, if properly treated, has a shelf life of up to 8 months. Eland have even been used as draught animals (a beast of burden) by some cultures. It is no wonder that some Southern African farmers have made the switch from cattle to the more eco-friendly eland and that this handsome antelope has been lauded on coats of arms such as that of Grootfontein in Namibia. Unfortunately, even with its easy-going adaptability eland are running out of habitats and have become restricted to protected areas, with Etosha National Park hosting one of the largest populations of eland worldwide. Eland can also be seen on the farmlands around Outjo and Tsumeb and in the Kalahari Desert during your trip to Namibia.